Our classrooms are located in healthcare centers to facilitate intergenerational learning. In this environment, our students have the opportunity to interact with residents in programs structured to promote inclusiveness and collaboration across generations. 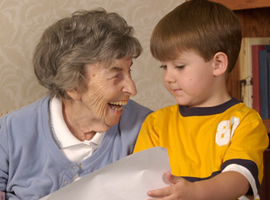 Intergenerational Learning describes the way people of all ages can learn together and from each other. It is an important part of Lifelong Learning, where different generations work together to gain skills, values, and knowledge. Beyond the transfer of knowledge, this structure fosters reciprocal learning between different generations, and helps to develop social capital and social cohesion in our aging societies. Residents join the children for crafts, gardening, singing, and baking. These interactions between children and residents reflect the importance Country Hills Montessori places on the role of community in the healthy development of the child. Intergenerational Learning is a continued hallmark of the Country Hills Montessori schools.